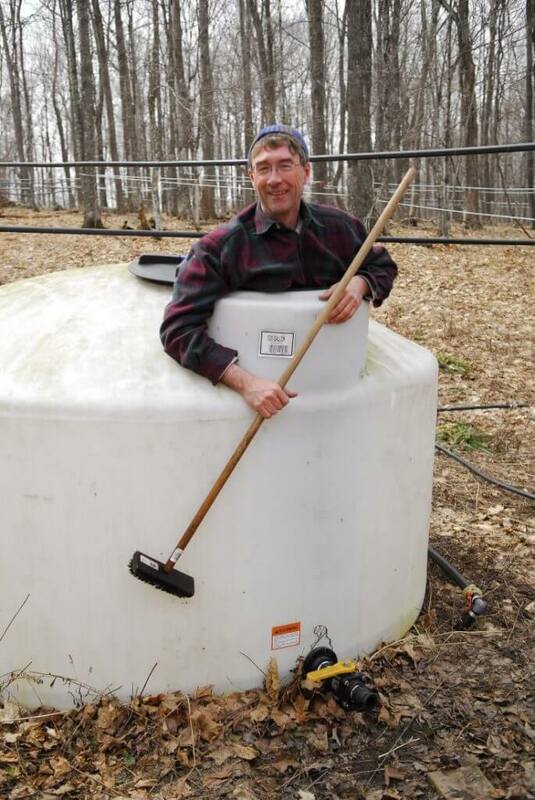 Buckets, spile, and a mallet carved from wood; a hand operated auger; horses and wagons to haul sap; piles of firewood to boil the sap; and a large kettle in which to boil it. These were the tools of the sugarmaker in 1900. The term, “Sugarmaker”, is used to refer to the farmer who crafts maple syrup and sugar by harvesting and boiling down sap from a maple tree. (Read more about the process here.) Since then, the process has changed to become cleaner and easier to perform. Today, the majority of sugarmakers practice a much more modern method of their trade. However, this newer method comes with its own set of tools. What are they, and what do they do? 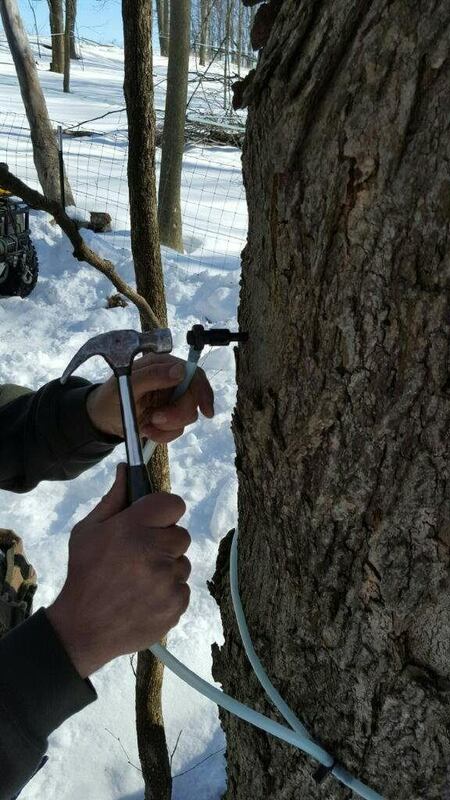 We will explore some of these tools of the trade and discover their role in the process of creating syrup from sap. 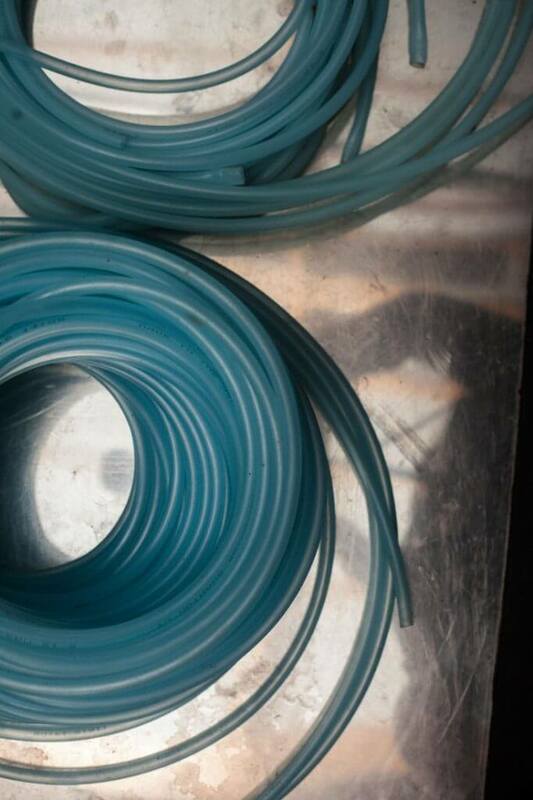 Tubing used is typically 5/16″ and is made of a food-safe, BPA free plastic. A network of tubing is set up in the sugarbush. Smaller tubing stretches from tree to tree where it attaches to taps. 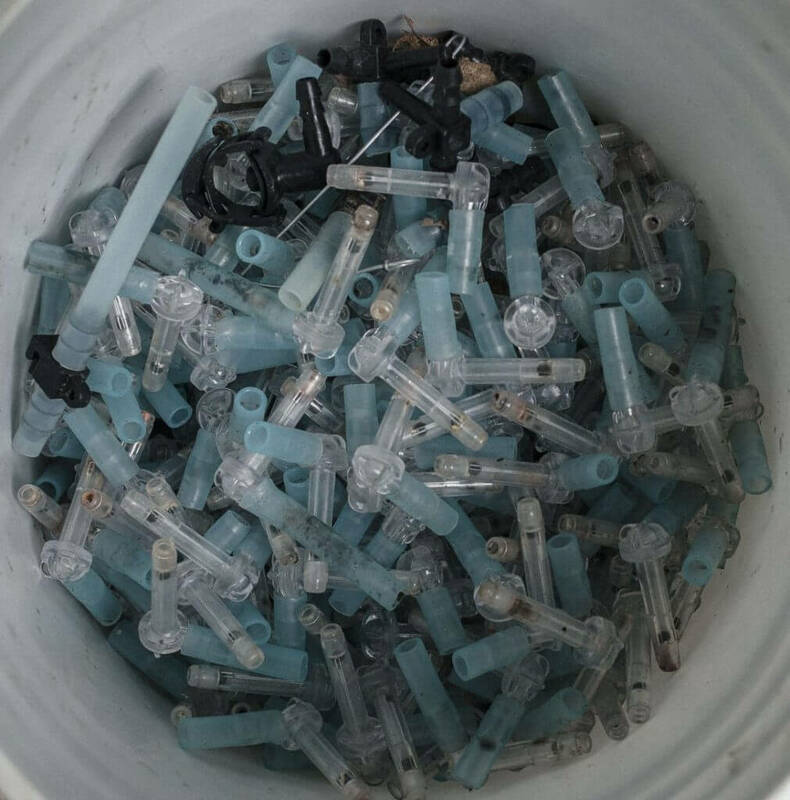 Often, these smaller tubes feed in to larger tubes which eventually reach holding tanks. Tubing is held together by fittings that are attached using a special tool. A tubing tool is used to hold tubing lines in place while affixing a fitting to connect tubes. A standard hammer is used to gently push the tap into the hole that was previously made. Organic standards require the tap used on a tree to be small in size. Therefore, a 5/16″ tap is typically used. 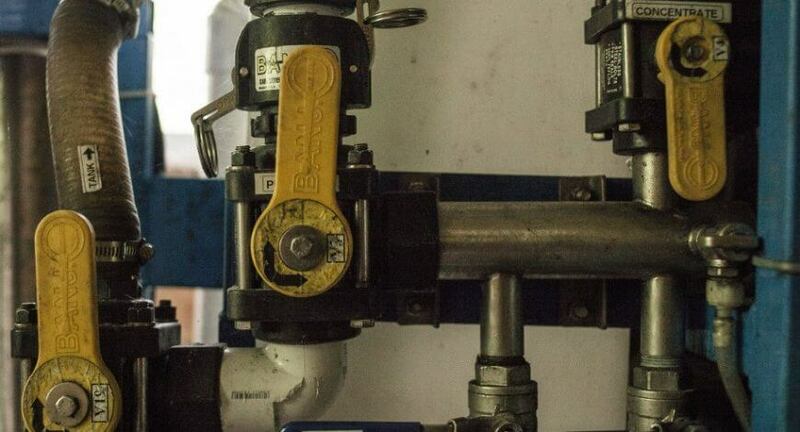 Tubing is attached to these taps and sap flows from them and in to the system of tubing. 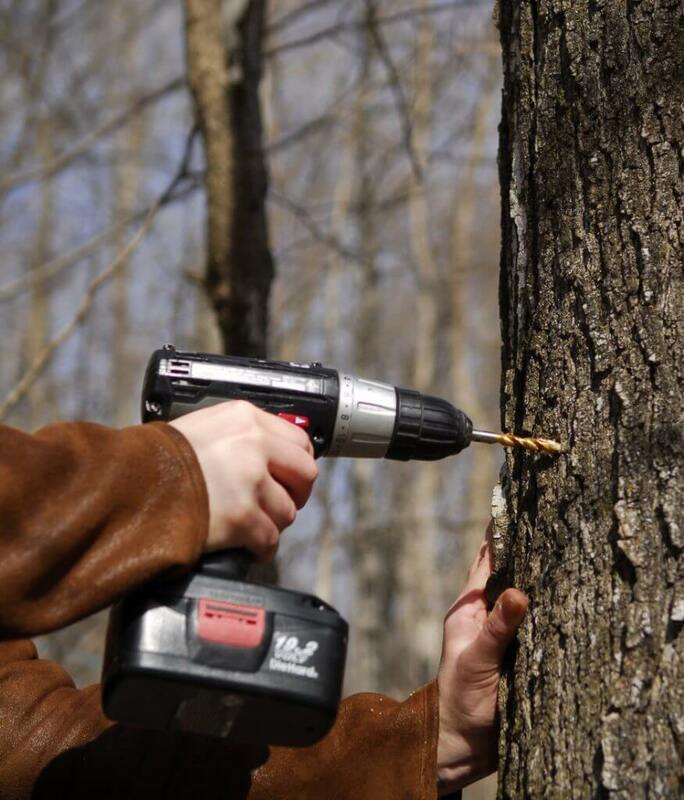 Vacuums can be used if needed to keep the flow of sap headed in the right direction. If sap lines naturally flow downhill, a vacuum is not typically needed. However, some sugarmaker’s sugarhouses are located uphill from their trees. In instances such as these, a vacuum pump can be attached to the tubing network. 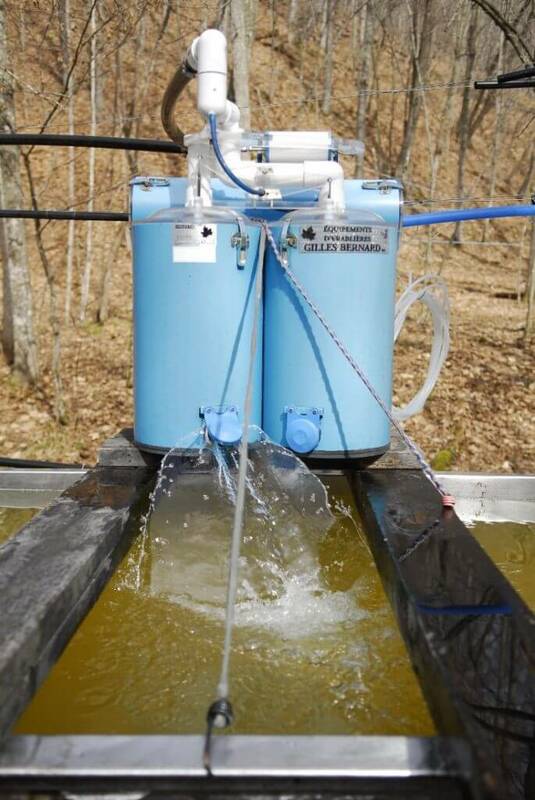 As sap begins to flow, a releaser can be used in conjunction with a holding tank. Sap fills the first canister and a float inside activates a piston. The piston works a mechanism that releases the sap into the storage tank. While this is occurring, sap begins to fill a second canister. The process continues, switching between the two canisters. This keeps the flow of sap from being interrupted and helps to maintain a vacuum seal on the lines. Holding tanks are used to contain the large amount of collected sap while it waits to be processed inside the sugarhouse. These tanks can be very large and there are often more than one of them utilized in a sugarmaker’s setup. The sugarhouse is the building that houses the remaining steps in the process. Inside can be found the RO Machine, Evaporator, Filter, Barrels, and of course, the sugarmakers themselves. This building is normally quite tall and includes a vent at the top to release steam and excess heat that radiates from the evaporator. 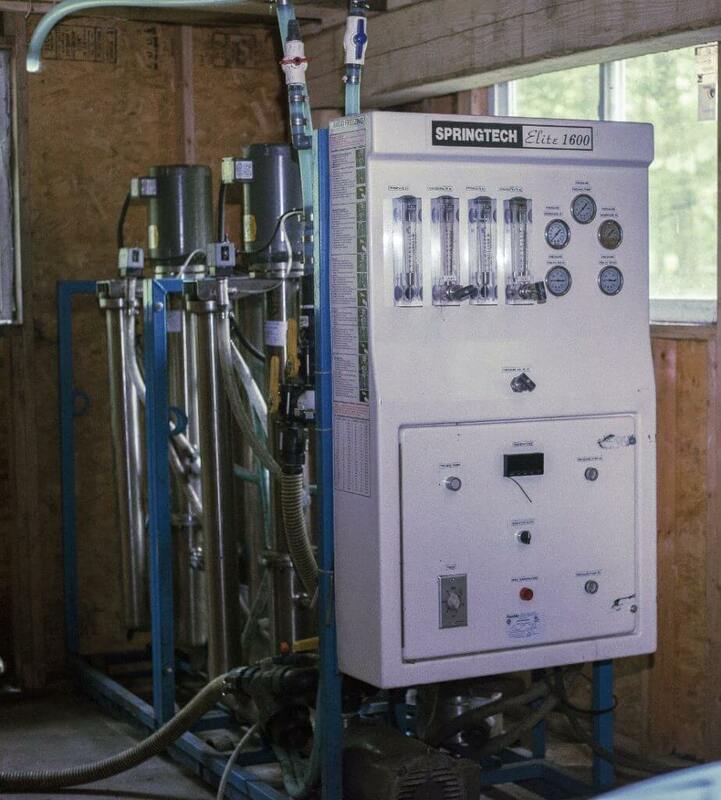 Many sugarmakers use reverse osmosis machines to speed up the process of evaporation. This machine is very similar to machines used to purify water. This is done by applying pressure to force liquid through a membrane. However, the purified water is discarded. Instead, the more concentrated sugar and minerals are kept. The water is discarded and the remaining sap concentration is sent to the evaporator. 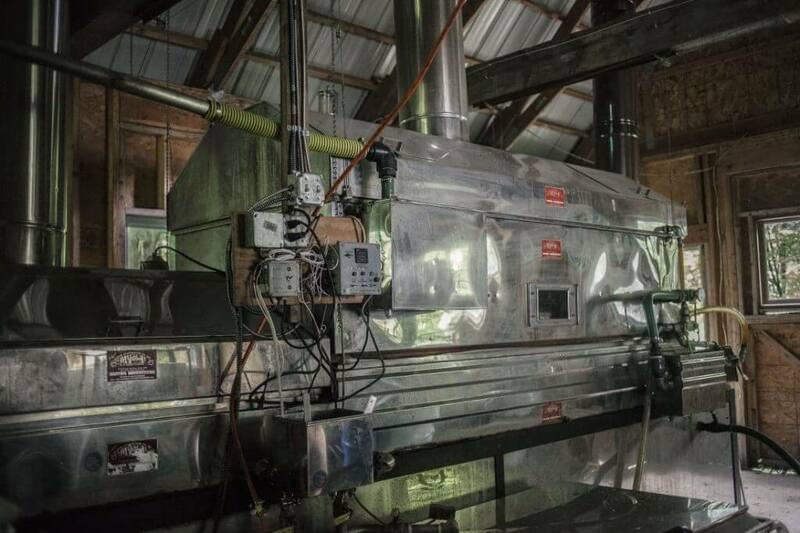 Once the sap has been moved to the evaporator, it is heated to boiling. Modern evaporators often use electricity to heat instead of burning the large piles of wood that were previously required. As the sap boils, steam escapes through the vents at the top of the sugarhouse and the sap becomes concentrated into syrup. Generally, these evaporators are usually very large and fill up the main part of the sugarhouse. Finally, the syrup must be filtered. Once the syrup is ready, but still hot, it is sent through a filter press to remove any remaining impurities. This filter press contains many layers of filter paper which the syrup is forced through. Once filtered, the syrup is transferred to barrels and brought to Maple Valley’s Headquarters where it is bottled and sent to you, our customers. Enjoy! This whole process is very impressive and more involved than I knew. Thanks for sharing this knowledge with us your customers. We get to appreciate more all the work and caring that you do to make this great tasting syrup. Kudos too for your care for the maple trees!! We appreciate all that you do! !